Swarovski 5328 Xilion Bicone 6mm Crystal Cal (Comet Argent Light) *new*. 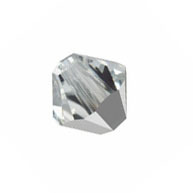 This is a beautiful silvery crystal bead. Sold in packs of 24. Also available in 4mm.